Made of premium thickened and soft fabric, it is super soft, warm and comfortable. The whole sealing design makes sure its great water absorption performance and allows you to use without concern. Choose one and upset situation will never happen again. - Made of premium thickened and soft fabric, it is super soft and defenses against leak. - Super strong water absorbency, offers generous coverage and protection. - Easy to wash, just wash it by hand or machine. - Non slip design, it stays in place and does not slip and slide when you wake up next morning. Made of premium thickened and soft fabric, it is super soft and defenses against leak. Super strong water absorbency, offers generous coverage and protection. Easy to wash, just wash it by hand or machine. Non slip design, it stays in place and does not slip and slide when you wake up next morning. If you have any questions about this product by ROSENICE, contact us by completing and submitting the form below. If you are looking for a specif part number, please include it with your message. 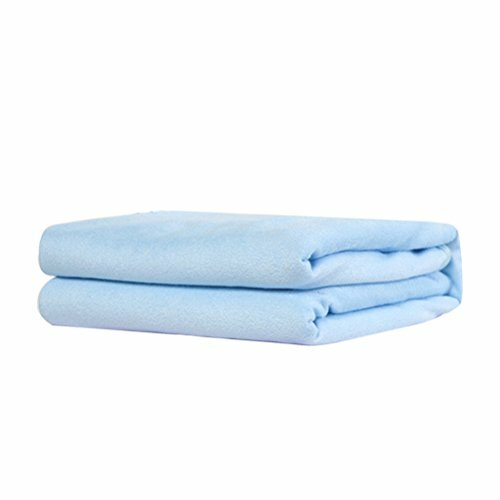 Liveinu Cotton Blends Waterproof Reusable Incontinence Bed Pads Washable Underpads 8 Cups Absorbency Mattress Protector for Adults, Kids and Pets 58"x70"